In the beauty contest of native plants, viburnums are the quiet, come-from-behind winners. It is true that their common names might cause side glances and a few snickers between the judges and audience (“…and here comes Miss Possum Haw, followed by Miss Black Haw…”) but their humble names hide their sophistication, particularly when in bloom. Their common name refers to their resemblance to hawthorne trees (to which they are not related). Occasionally landscapers will extol their virtues with enthusiasm, ranking them at the top of their go-to list for utility and appearance, but more often, they are relegated to the why-not category. 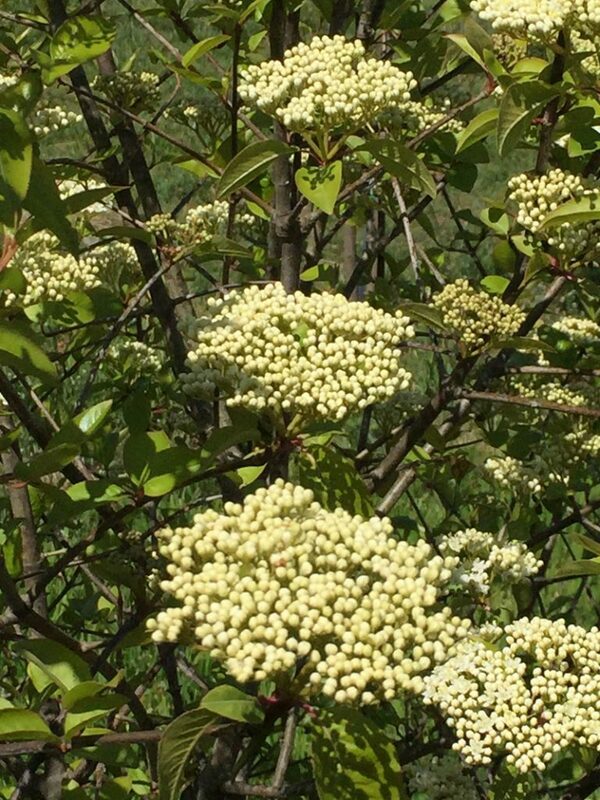 At White House Natives, we would like to shine a spotlight on both Viburnum nudum and Viburnum prunifolium. 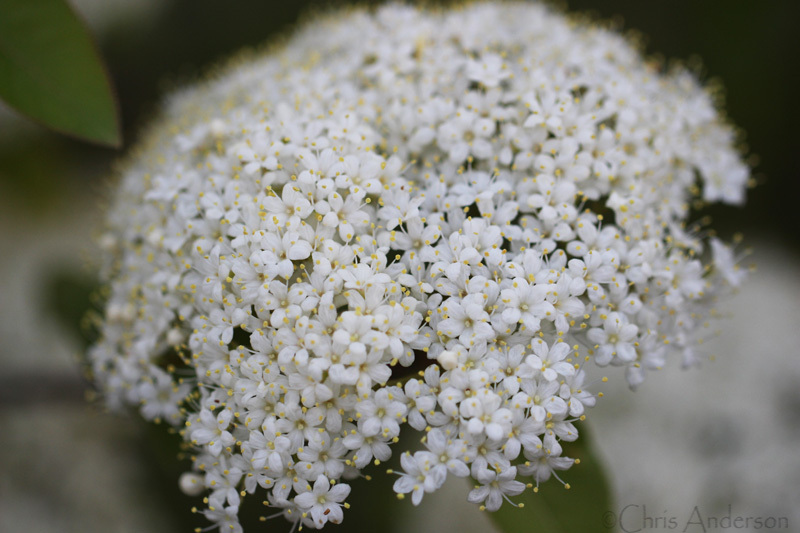 The beauty of the native species’ flowers rivals that of the non-native snowball bush or the non-native hydrangeas. 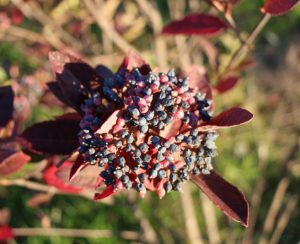 These are also in the genus Viburnum (of which there are over 150 species) but these two ornamentals are both from Asia. These imports don’t serve as larval hosts to many (if any) native caterpillars or insects. 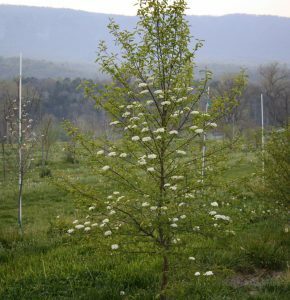 As with all the native trees and shrubs grown in the Nursery, the Black Haw and Possum Haw are meant to grow in Virginia and across their native range throughout the mid-Atlantic states– they are supposed to be here and, as such, they are integrated into the natural order of faunal associations. 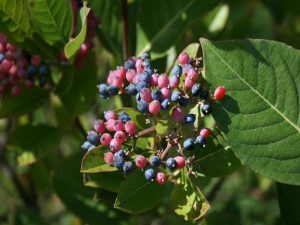 Birds feast on the dark blue to black berries (that start out pink) in the fall which fuels their migrations south or helps our avian friends make it through a winter if they are year-round residents. The branching structure provides valuable habitat for birds, allowing them to build their nests in the protection of the many smaller twigs and helping disguise the location of the babies from predators. 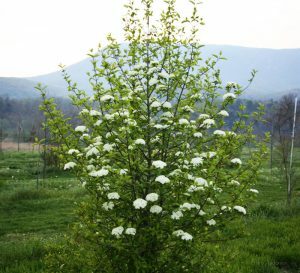 The native viburnums grow about 12-20’ in height and 6-12’ in width. They are versatile in their location, able to handle drier sites and withstand drought plus they thrive in full sun or part shade. They can be grown as multi-stemmed bushes or as interesting single stem trees, in which case, they can reach heights of 25-30’. One final reason the native viburnums should take a more prominent position in the landscape is their fall foliage, which provides a splash of dark burgundy that is particularly stunning when planted en masse. Viburnums lend themselves well to establishing a very attractive hedge and serve as a native replacement to privet which tends to become invasive.